So here we are and we are going to get into the Ichimoku System. We’re going to start breaking this down and then we’ll start getting into the trading system, the trading styles, all important factors and we’ll go from there. Now, let’s get started! Ichimoku Kinko Hyo: This system was developed by the Japanese journalist . 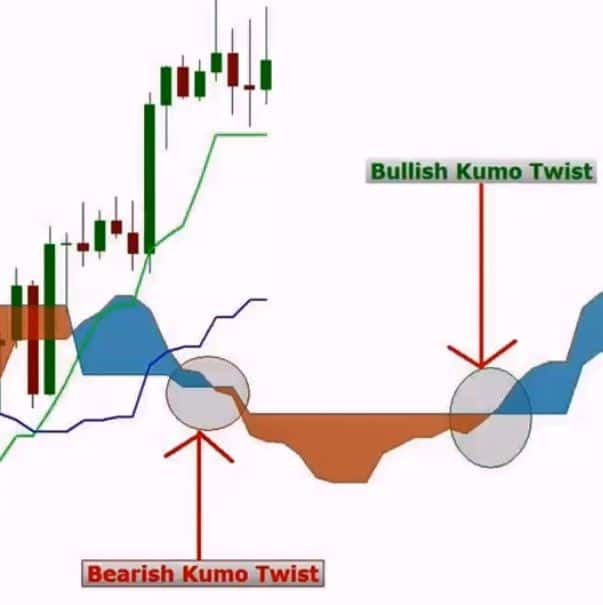 The history of Ichimoku is that it is a technical analysis method that builds on Candlestick charting to improve the accuracy to forecast price moves. It was developed in the late 1930s by Goichi Hosada and he was also known as Ichimoku Sanjin which can be translated to “what a man in the mountain sees”. He spent 30 years perfecting this technique before releasing his findings to the general public in the late 1960s. So basically, this guy spent 30 years perfecting this and studying it, which means there’s a lot of validity to this system based off of him doing all the back testing and preparing it for 30 years. 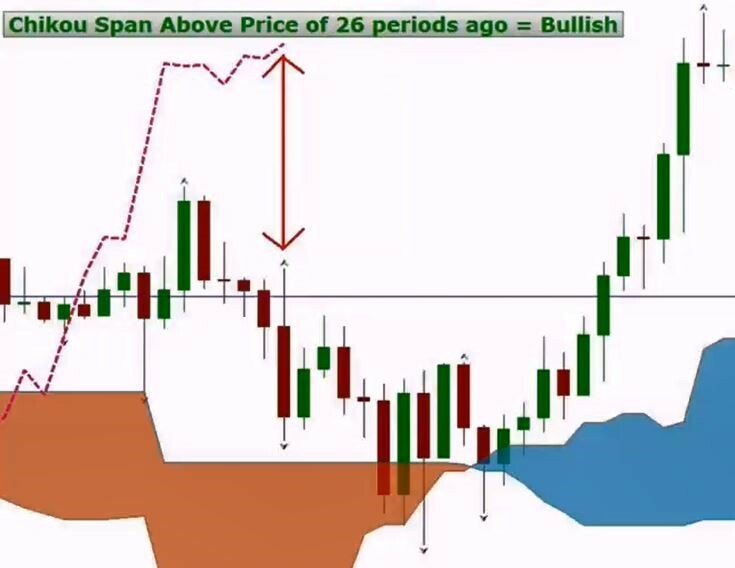 Ichimoku translates to “one glance equilibrium chart” or “instant look at the balance chart” and it is sometimes referred to as “one glance cloud chart” based on the unique clouds that are featured in the Ichimoku charting system. 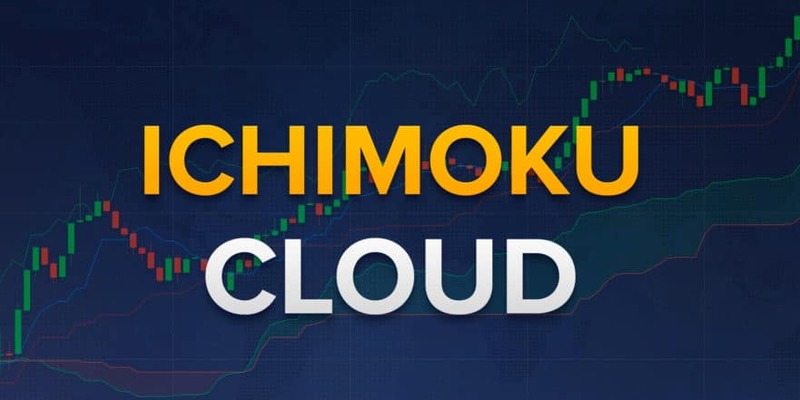 Ichimoku is a moving average based trend identification system and because it contains more data points than the standard Candlestick charts, it provides a clearer picture of the potential price action. The main difference between how moving averages are plotted in Ichimoku as opposed to other methods is, that Ichimoku lines are constructed using the mid price of the highs and lows for a certain period as opposed to the candles closing price of a certain period. 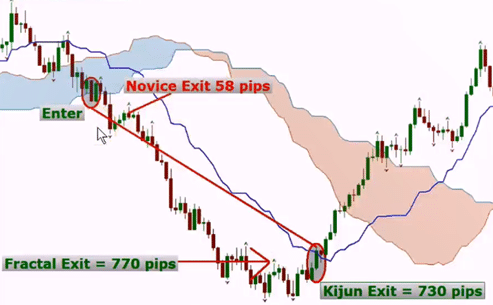 Ichimoku is the most often used indicator in the Japanese trading rooms. As said before, it’s a trend based technical analysis method that measures the momentum of the market. Its purpose is to show the bias of the market with one glance based on the price of an asset as opposed to the “Kumo Cloud”. It uses multiple units of observation to give you a deeper more comprehensive view of price action. Together, the units of observation and levels of analysis help to give you a deeper view of price action and whether or not prices are in equilibrium or disequilibrium and those are very important to know. Ichimoku also shows past, present and future support and resistance levels making it the only indicator that is both leading and lagging. It does not show future price levels but it shows future support and resistance levels which are very important and which can give us a lot of leads on what the market might do or could be doing. It’s also used to generate buy and sell singles and a variety of ways and also shows the strength of a signal. So, in a nutshell, the Ichimoku system combines market bias, momentum, volatility, support and resistance levels and trading signals. “Discipline” is one thing that traders need. Discipline is one reason why we see 95 percent of traders failing in the Forex market, many traders lack of discipline. Discipline is something that every trader needs to learn. Ichimoku is going to make sure that you’re disciplined. Another reason why traders fail is “patience” – or rather the lack of. 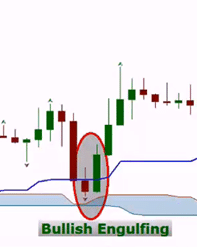 As a Forex trader, you have to wait on the right opportunity based off the Ichimoku rules and signals. This means that you have to be patient and wait for those trades. A lot of traders are not patient and they jump in trade after trade and just want to be quick and get into a trade, get it done and jump into the next trade. Well, that’s not how trading works. You have to set this up like a business and act like it’s a business. Trading is rules-based and if you set your trading up by a pre-determined set of rules it will keep the emotional side of trading disengaged. You will not be using your emotions to trade Ichimoku. If you’re using your emotions, it’s usually just because you’re excited and overcome with joy when you see prices going one hundred pips in your favor. That’s the only emotion you’ll have here. Ichimoku catches the best of a trend. The Elliott third wave is normally the largest and most profitable wave and Elliott Wave traders will tell you that the third wave is the wave they like to catch. Ichimoku is going to catch that wave every time. It is just knowing how to get in the move and you’ll learn exactly that: being able to catch these third waves. We’re going to eliminate the “Doubting Thomas Syndrome”. This system is going to give you clear cut rules, no guessing about market bias and you will know exactly when trading conditions are right. You’re going to see the signals and you’re going to know that the trading conditions are right to enter the trade. It’s going to eliminate any Doubting Thomas Syndrome that you may have. Ichimoku will help you to develop order in your trading, but you’re going to have to follow specific trading rules and you’re going to have to look at specific things before you can get into a trade. Everything’s going to be in order and certain things will have to happen for you to get into a trade. It won’t allow you to be scattered and getting in trades here and there and just jumping around. You’re going to have order in your trading and you will have to develop some fundamental analysis skills like support and resistance, knowing market bias and so forth. In regards to market bias: you are going to always know who’s in control of the market short term, medium term and long term. You will know if the bulls are in control or if the bears are and that will help you to make a decision if you want to get into the market or not. This is a standalone system and you do not need to use anything else with this Ichimoku system. It has Stop-Loss, entry and exit levels. Everything is included and no other indicator is needed. It also works in all markets. It’s going to work in Forex, stocks, options, indices, etc. You’re going to be able to trade Ichimoku on absolutely everything. It also works on all time frames. But the higher timeframes are going to be more reliable, so you’re going to be getting stronger signals off of the higher timeframes. The smaller signals can give you more signals but they are also less reliable. The higher timeframes are much stronger. This system is as easy as the ABC. It may look confusing at first, but with some effort to learn it becomes easy. We said this in many of our other classes but we repeat it here again: you have to put effort in anything. If you don’t put a lot of effort into this you will not learn it and you will miss out on being a successfull trader in this system. Ichimoku Kinko Hyo translates to “one glance equilibrium chart”. 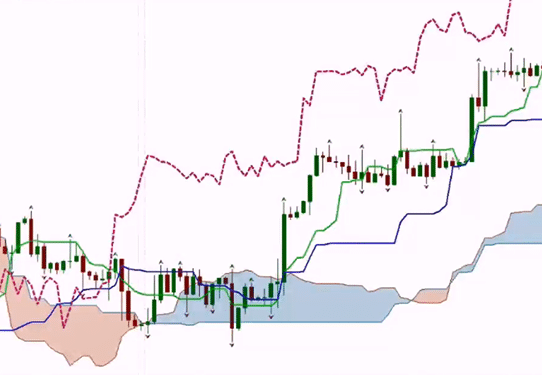 Ichimoku is all based off of equilibrium and we’re going to show you why. 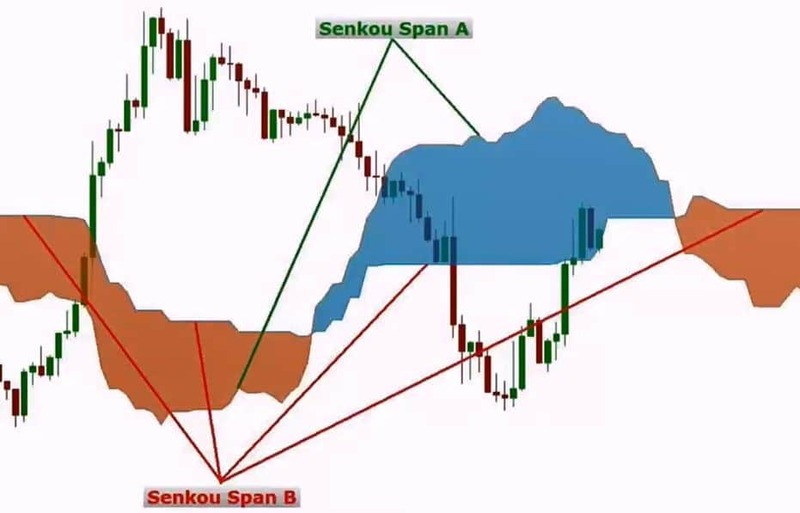 Ichimoku equilibrium is very important in trading and you will understand once we get into it and break it down why you should really know about equilibrium and know when the market is in equilibrium or disequilibrium. You probably already know it when you see your indicators like a stochastic, for example, and you say “we’re oversold” or “overbought”. That’s market equilibrium or disequilibrium. Ichimoku works on the concept of market equilibrium. Demand creates market equilibrium and market disequilibrium. The point at which supply and demand are equal is known as “market equilibrium”. This point represents the price at which the quantity demanded by consumers is equal to the quantity supplied by producers. This is the ideal outcome in the market because the most efficient producers are sellers and those who are most willing to pay are the buyers. So, market equilibrium maximizes both consumer and producer surplus and extracts all the potential gains from the market because both sellers and buyers are contributing to the market at near equal amount, keeping the market stable or within a range. At this point, if either buyers or sellers out-whey one another, the market begins to move away from equilibrium and into disequilibrium. Understanding the concepts of market equilibrium and disequilibrium will contribute deeply to understanding the Ichimoku system. What is market equilibrium? It’s a situation in which the supply of an asset is exactly equal to its demand. Since there is neither surplus nor shortage in the market, price tends to remain stable in this situation thus creating equilibrium. So basically, you have supply and you have demand. And then in between supply and demand you have equilibrium. What is market disequilibrium? Prices are either too high and prices will fall. Quantity supply decreases and the quantity of demand increases. Or, in another scenario of market disequilibrium the price is too low and there is shortage. Prices will rise, the quantity supplied increases and the quantity in demand decreases. Tenkan Sen: also known as the convert version line. Kijun Sen: also known as the reference line. Chikou Span: also known as the lagging line. Senkou Span A: also known as leading or proceeding line 1. Senkou Span B: also known as leading or proceeding line 2. Kumo: also known as the cloud. It is the shaded area between Senkou Span A & B. It stands out more than anything else in the chart. Let’s start off with the Tenkan Sen. This calculation is the highest high and the lowest low of the past nine periods divided by two. It’s the midpoint of the past 9 period. This means, that if prices are above that midpoint you know that it’s a short term bullish signal. If it’s below, then you know it’s a short term bearish. It’s the fastest calculation of all the indicators and it works off of nine periods. It shows you short term bias, short term supply and resistance, short term momentum and the primarily used for this is the Tenkan Sen crossover that we get with the Kijun Sen and TK Cross Signal. The picture below shows a green line which is going to be our Tenkan Sen.
Now let’s look at Kijun Sen. It’s the highest high and the lowest low of the past 26 periods divided by two. Notice, it’s the same calculation as the Tenkan Sen, but it’s for a longer period of time. It’s a stronger signal because it’s for a longer period of time. It’s the midpoint of the past 26 periods. There mid is equilibrium. It is medium term bias which is like a medium moving average. It’s not the long base moving average. It’s the medium base moving average therefore it’s going to be medium term bias. It’s also going to be medium term support and resistance and medium term momentum. The Kijun Sen level is equal to the equilibrium, which means that when prices near the Kijun Sen the markets are in equilibrium. When the market is too far away from Kijun Sen the market is in disequilibrium because there is excess in demand. The trend might continue for a long time but eventually it will come back to equilibrium again. All of this tells us that in between excess supply and demand lies the market equilibrium. Excess supply equals market disequilibrium because price is too far away from the Kijun Sen. When other traders use their other indicators like the stochastics and RSI they would see a overbought or oversold situation – excess supply so the market is in disequilibrium. However, we don’t need an RSI or stochastic to tell us that, because we can see that by simply looking at the Kijun Sen.
Now let’s move on to the Chikou Span. 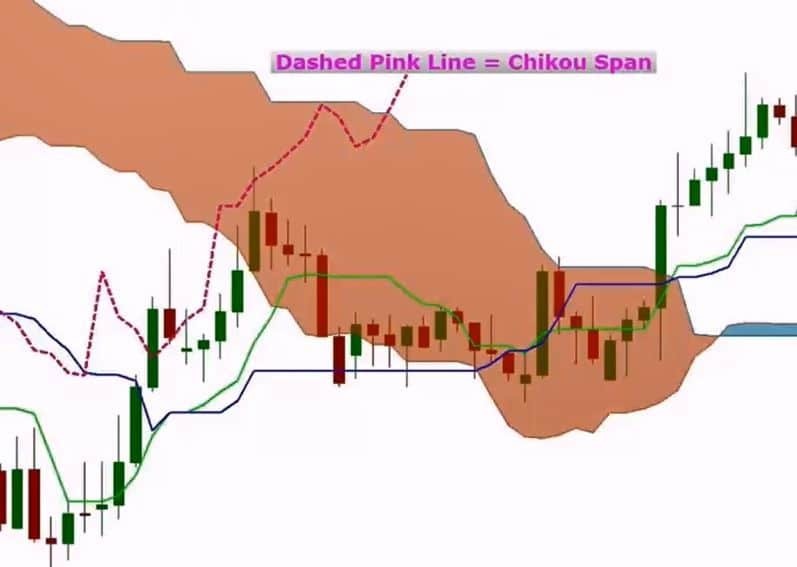 Remember that the Chikou Span is going to be very important to your trading! All it really is in the end, is the current price shifted back 26 periods. When we look at our price today and draw a straight line 26 candles back, that’s where our Chikou Span is. 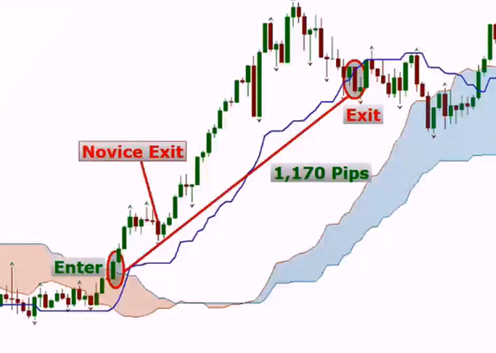 It is perhaps the most important aspect of the Ichimoku system when entering a trade. > It indicates if price is trending or ranging. > It’s the final filter for entering a trade. > Helps to keep us out of bad trades. > It will be your decision maker when entering a trade. > Chikou Span above the price of 26 periods ago means that the current price is bullish. 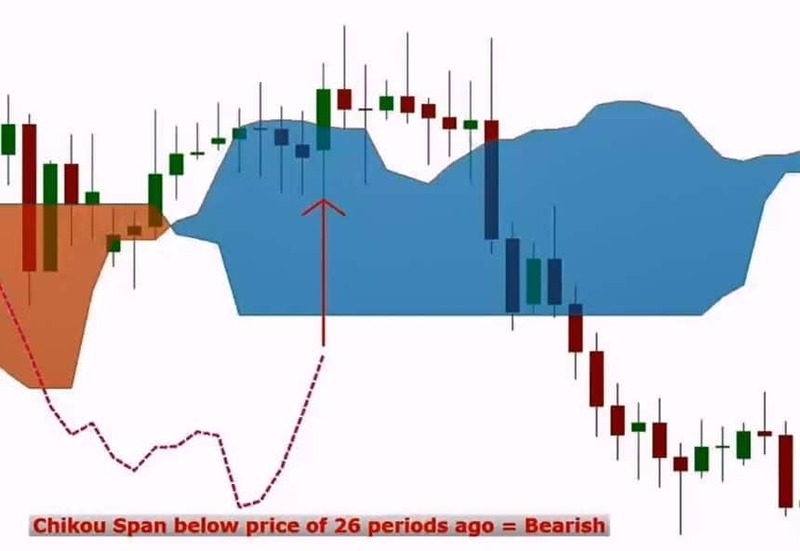 > Chikou Span below the price of 26 periods ago indicates that the current price is bearish. 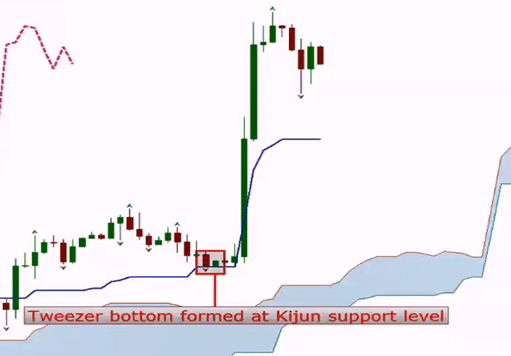 > It indicates past levels of support and resistance such as the Kumo and price ranges. 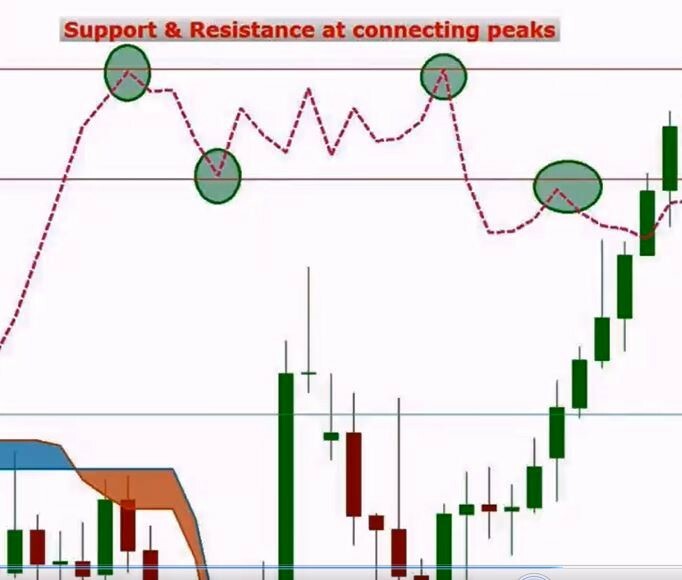 > It is a more reliable form of plotting support and resistance much like a line chart. 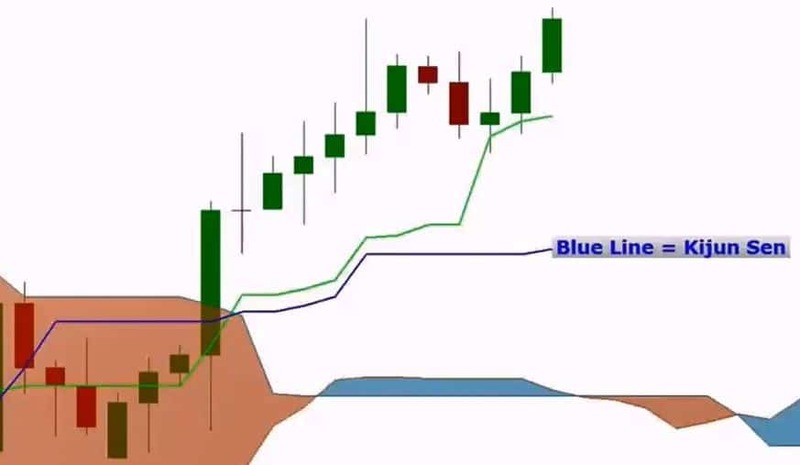 We can draw support and resistance like a line chart using the Chikou Span. Here below we can see a typical Chikou Span. This dashed pink line is the Chikou Span and it’s back 26 periods from the current price – 26 candles if you count each candle. So where is the Chikou Span based on the 26th candle back? It’s above that candle. Going back 26 periods / candles we check if the Chikou Span is above or below that period. In this example here it’s above, which indicates a bullish trend and we would enter a Long position. This also works the other way: Going back 26 candles and here we have the Chikou Span below the price which indicates a bearish trend, giving us the signal to enter a Short position. The next picture shows that our Chikou Span is right inside this price range. And what is price doing here? Correct, it’s ranging all throughout. We haven’t really moved and price staid pretty much at the same level. That’s how the Chikou Span can tell you if it’s smart to get into a trade or not. You know, because this is clearly ranging and there’s no need to get in a trade. Let’s have a look on how you draw support and resistance levels with this. Where we see the peaks we draw support and resistance levels. Let’s move on to Senkou Span A. > It’s the Tenkan Line + Kijun Line divided by 2 plotted 26 time periods ahead. This means we’re going from the past into the future or from “lagging” to “leading”. > Together with the Senkou Span B it forms the shaded area known as the Kumo. > Together with Senkou Span B it forms the Kumo Twist and the future Kumo sentiment. > The trend is bullish when Span A is on top and bearish when Span A is at the bottom. > It represents a level of equilibrium. > It measures a longer term trend. > It also represents long term support and resistance. > It measures market volatility will always. > It will always be between Tenkan Sen and Kijun Sen current level but 26 periods ahead. > Senkou Span A is normally never flat while Span B has more periods where it’s flat. You don’t necessarily need to remember all of this but it’s certainly good to know. 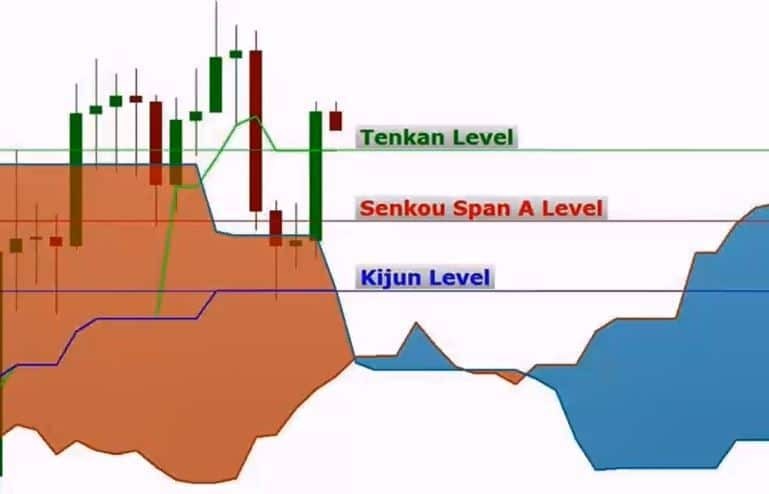 In the below graphic you can see that Senkou Span A is between these two levels: Tenkan Level and Kijun Level. It will always be between both of them, no matter where the chart goes. If they go tighter it’ll be between both of them and if they go farther it will also be between both of them just like it is exactly between both of them here in this graphic. Now we’ll get into Senkou Span B. > It is the highest high and the lowest low divided by 2 calculated over the past 52 time periods shifted 26 periods ahead. > This is the slowest of all the components because it’s calculated using 52 periods. > Together with Senkou Span A it forms the Kumo Twist and future Kumo sentiment. It helps us know if we have a bright or dark future which helps us to get into a trade knowing this sentiment of the market. > The trend is bullish when Span B is on bottom and bearish when Span B is on top. > It forms flat Kumo tops and bottoms if price hasn’t made a newer high over the past 52 periods. Here we can see Senkou Span B flat on top (brown cloud left) and flat bottom (blue cloud in the middle). Now it’s on top flat right here. You don’t have to remember Senkou Span A on top or bottom. Just remember if your cloud is bearish it’s going to be brown (in our example) and if it’s bullish it’s going to be blue (again, just in our example). Now your colours may be different but the colours simply help us to know the twist. We know that if Span A or B is on top or bottom just by the colour of the clouds. What we can clearly see in this example is the flatness of Senkou Span B and that’s going to be strong major support and resistance levels. We can also see how Span A is normally never flat. Even when they cross or even when Span B is flat for a long time it’s still never really flat. We can see that there are some parts that are almost flat and they simply tell us that the market was really ranging during those periods. Let’s move on to the Kumo, which is the last thing we really have to remember. > The Kumo is the shaded space between Senkou Span A & B. > It determines market bias: if prices are above the Kumo you got bullish bias and if price is below the Kumo it’s bearish bias. 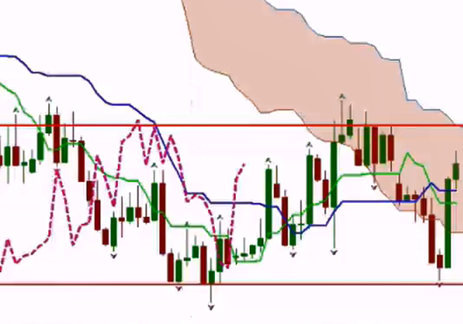 > It identifies the current and future support and resistance levels rather than lines. 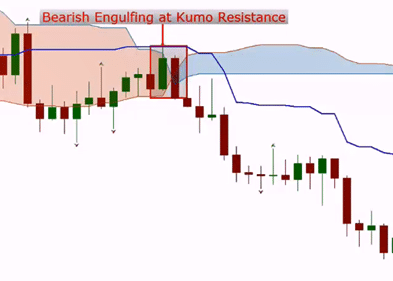 > Thicker Kumo represents higher volatility and stronger levels of support and resistance. 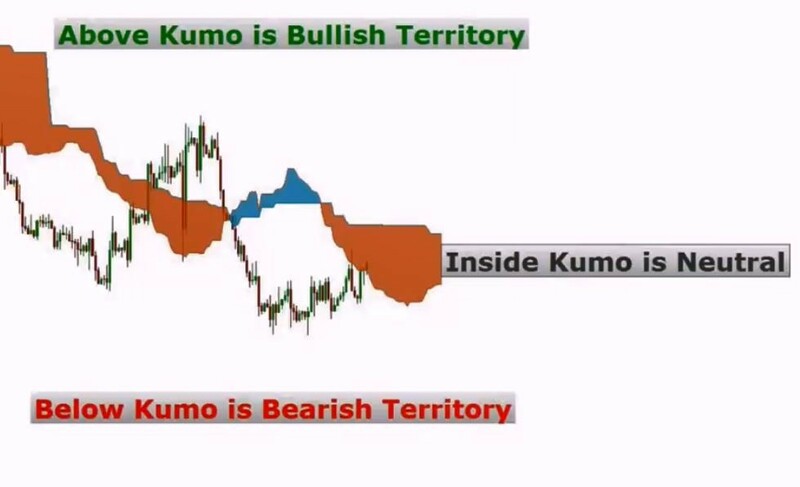 > A thinner Kumo represents lower volatility and weaker levels of support and resistance. 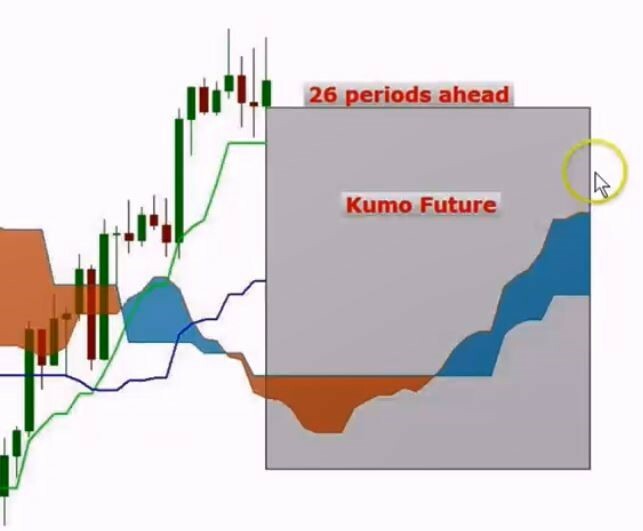 > Kumo future is the Kumo shifted 26 periods ahead to form future support and resistance levels and future market sentiment. 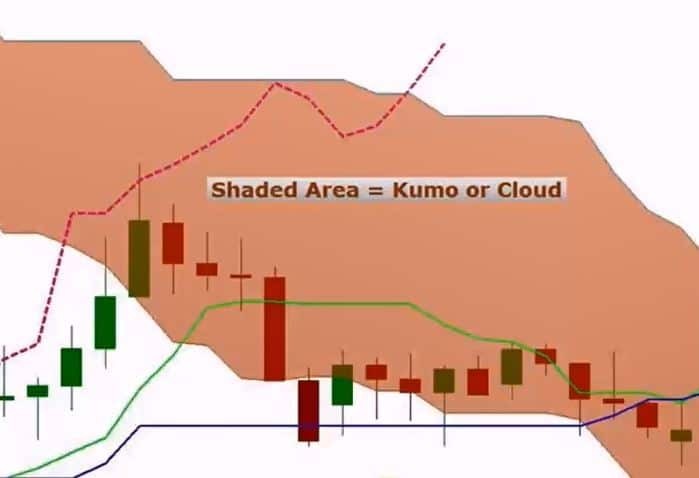 > The Kumo shadows are flat clouds directly behind price from past consolidation or range levels. These form support and resistance levels causing price to consolidate. > Every trend begins with a Kumo Breakout. Here below is the Kumo cloud. This is why you don’t have to remember Senkou Span A and B. You simply remember this cloud since all is one. Prices “flying” below the Kumo cloud means we’re bearish. We can simply look at the chart and can clearly see its’s bearish. We know the market bias and we know if we want to be Short or Long. In the above example the overall trend is down which means, once again, that’s bearish. We know that we may have some slight pullbacks here and there but we want to be going with the overall trend. Now, the thickness of the Kumo represents support and resistance levels. Weaker levels are represented by a thinner cloud. Have a look below and notice how thin this cloud is. Prices blew right through it, then it paused and then took off. To repeat, a thinner cloud equals weaker support and resistance level and a thicker cloud represents stronger support and resistance level. Here an example where we can see that price had a hard time trying to get through the cloud and it took a really long time before it took off and went to the top side. The thicker the cloud, the stronger the support and resistance will be. Now, the Kumo Twist is the crossing of Span A and B. Just look at the twists and you can say if it is a bullish or bearish twist. In fact, we can know this just looking at the different colours. It went from brown to blue. These are the minimum requirements to enter a trade and you will need to ask yourself these minimum requirements before you can enter any trade. 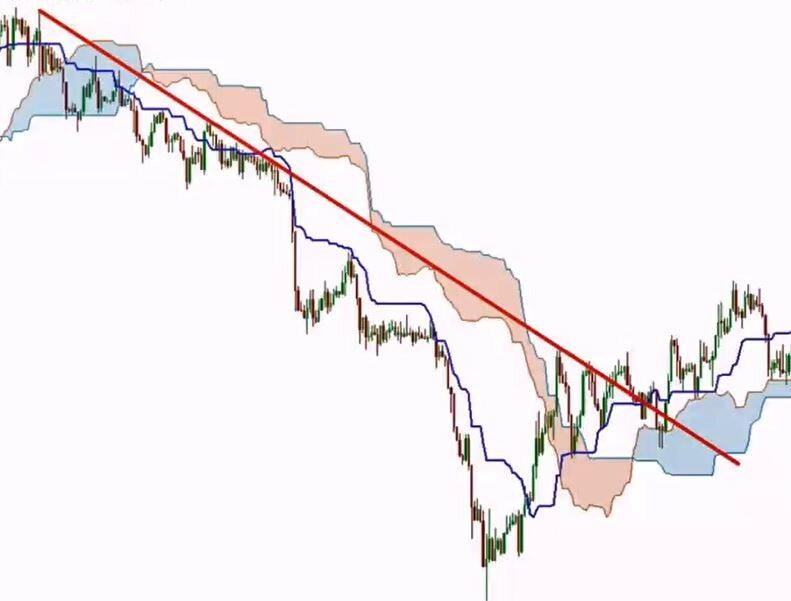 Price versus the Kumo: ask yourself that: is it above or below? If price is above it’s bullish sentiment. If price is below it’s bearish. If price is inside the Kumo cloud it’s neutral. So, if price is above the Kumo the overall trend is bullish and the market bias is also bullish. If it is below the Kumo the overall trend is bearish and the market bias is also bearish. When price is inside the Kumo we are in turbulence. 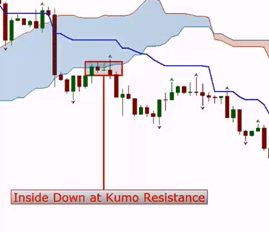 As discussed, the top and bottom of the Kumo are very strong support and resistance levels. If you have the prices above the Kumo, the Kumo top acts as the first level of support and the bottom acts as the second level of support. On the other hand, if price is below the Kumo, the Kumo bottom is the first level of resistance in the top as the second level of resistance. Ask yourself where is price as opposed to the Kumo before getting into a trade. Then ask yourself: where is Tenkan Sen versus Kijun Sen? Is Tenkan Sen above Kinjun Sen then we know it’s bullish. If it is below it is bearish. 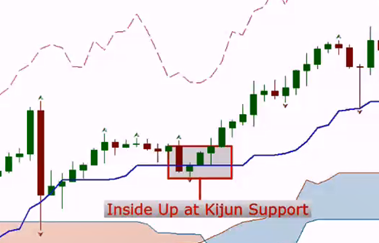 Tenkan below Kijun supports a bearish move while Tenkan above Kinjun supports a bullish move. It is always recommended to check the position of the price versus Kijun Sen and Tenkan Sen as opposed to just looking at the Kumo cloud. If the price moves quickly and leaves behind Kijun Sen it usually turns flat and in order to dissolve the disequilibrium it will pull it right back like a magnet. That puts the market from disequilibrium into equilibrium and then they move together again in the direction that the market wants to go. 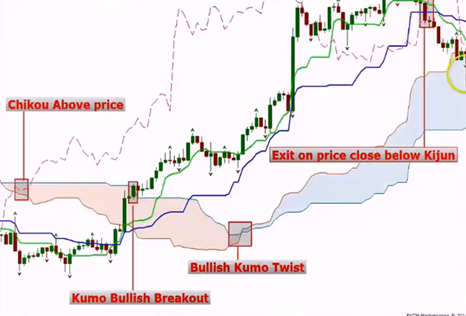 Chikou Span vs Price and Kumo: If Chikou Span is above price it’s bullish and if it’s below it’s bearish. Above or below Kumo for additional confirmation. So, if the Chikou Span is above the price the trend is bullish and if it’s below the price the trend is bearish. If it is within the price then there is no trend at all and price is consolidating or ranging. Ok, so if Chikou Span is above the Kumo it supports the bullish move and if it’s below the Kumo cloud the bearish moves are supported. The Chikou Span is your final filter to support your trade. The Chikou Span should be your best friend and not the trend! 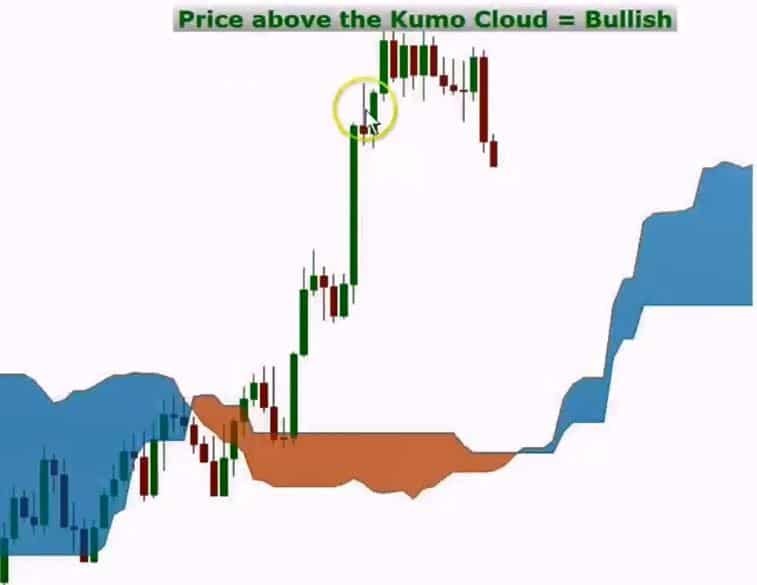 Kumo future: ask yourself: is it a bearish or a bullish future. If Senkou Span A is below Senkou Span B it indicates a bearish future. If Span A is above Span B it’s the opposite and signals a bullish future. When Senkou Span A crosses Span B and the colour of the Kumo cloud changes it supports the crossing of the Kijun, indicating a possible change in the trend. Basically, once price crosses the Kijun Sen and then we get that Kumo Twist, it supports the crossing of the Kijun Sen to represent a trend change or direction change, which then gives us confirmation to enter a trade. Alright, so that was a hell lot of information, we know, and you may be thinking “how am I ever going to remember all of this?”. We will break this all down on the charts which will help you see the economic strength of signals. 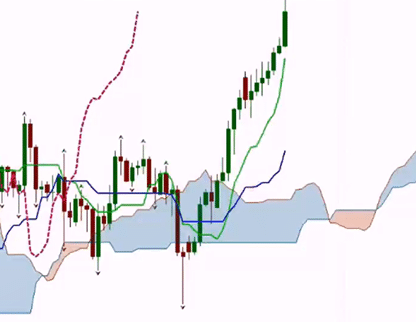 The Ichimoku System tries to put the probabilities into our favour, therefore not only do we have signals from this system but also the strength of the signal. The strength of the signal is determined by where the signal takes place and there are just 3 places where the signal can take place and they are as follows:. Above the Kumo cloud: = bullish signal. Inside the Kumo cloud: = neutral. Below the Kumo cloud: = bearish signal. Now, if we are taking a Long trade, which is a bullish trade, then we would want the signal to take place in bullish territory. This woulsd make the strength of the signal a strong signal. The same holds true if we want to take Short trade, which is a bearish trade. Then, we want the signal to take place in bearish territory, which would make the strength of our signal a strong signal. > TK Cross = Tenkan Sen crossing Kijun Sen from above or below. 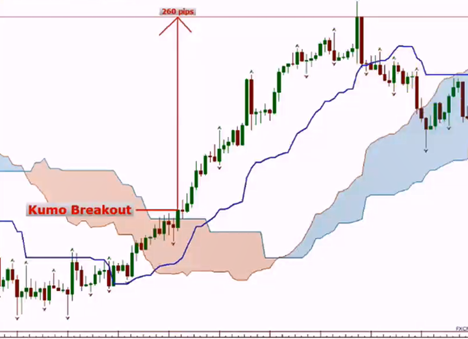 > Kumo Breakout = When price breaks out of the Kumo cloud from either above or below. 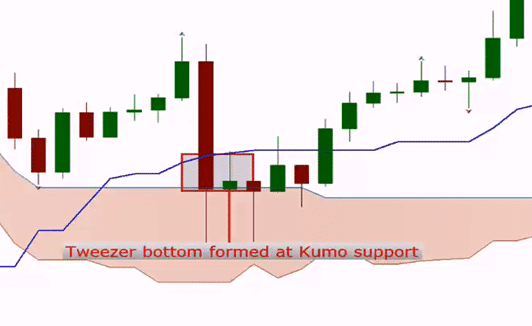 > Kumo Bounce = When price bounces off of the Kumo from above or below. > Kijun Break = When price crosses the Kijun from above or below. > Kijun Bounce = When price bounces off of the Kijun from either above or below. > Kumo Twist = When Senkou Span A & B cross each other. > Chikou Span Cross = Chikou Span crossing price from above or below. > Fractal Breakout = First fractal outside of the Kumo cloud. In this section we’re going to go over all the price action. We’ll be looking at the signals and the triggers but we’re not going to put it into real trades or show you exactly how to trade just yet because it’s going to be based off of Kijun Sen and the support and resistance levels. We want every trade we look at to be at a support and resistance level. No trade is going to be any good to us hanging in the air. We need a trade to be at a support and resistance level. One will be the Kijun Sen and you’ll find that’s going to be one of our major levels. Another would be the Kumo top or bottom, fractal level, etc. Okay, for now just remember to never take a trade that is not at a support and resistance level. Ok, so let’s get started with price action trading and we will take it from there. 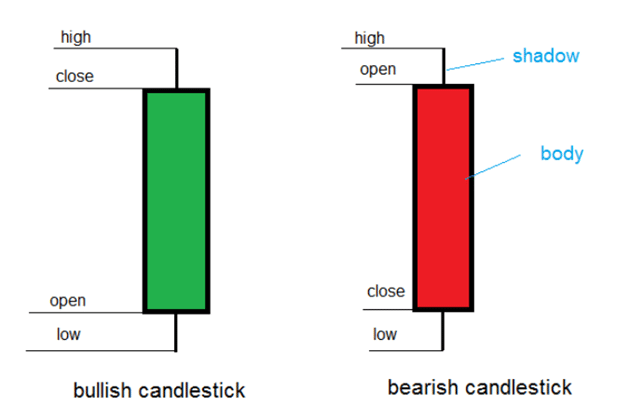 Just to quickly review, probably everybody knows about candlesticks and also knows that a green candle is a bull candle, a candle that reflects buying pressure. So, it is mostly about buying. That’s why it moves higher. You have your high and then you have your low. Top of the wick and bottom of the wick. Close and open price. 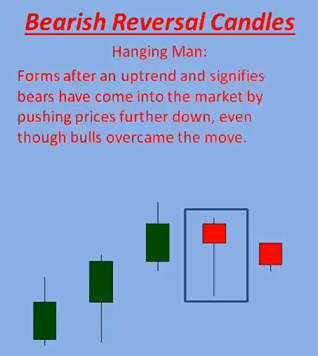 The same holds true for a bear candle. We have the high and the low. The difference is just that the open is up top and the close on the bottom. Bear candles are red. A long green candle represents buying pressure and a long red candle represents selling pressure. Candles with long “wicks” or “shadows” represent that either bears took control in the long run or, on the other hand, that bulls took control here. The red candle shows that bars took control here, because the market came down and went all the way up and then the Bears pushed it all the way back down. This shows the bears are in control in this example. In the other example, the bulls took control and they pushed the market. The market came a long way down, but the bulls were able to push the price and close the candle higher. 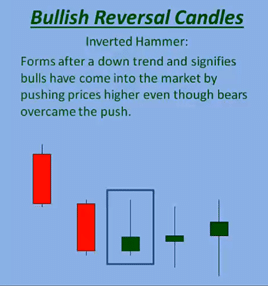 Below are the signals that we are going to be looking for and we are going to go over each of these signals, the reversal candle signals, because they are the ones that we are going to look for. So, we will be looking at the hammer and then a hanging man which is the opposite of a hammer. The we will look at the inverted hammer and then a shooting star, which again is the opposite of the inverted hammer. Then we will be looking at the Doji South and the Doji North. Piercing patterns and opposite would be dark cloud cover. 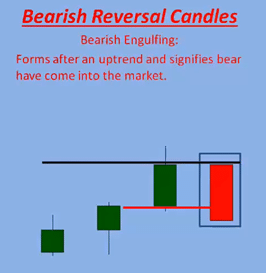 Then bullish engulfing and bearish engulfing. 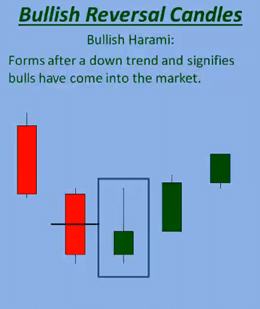 Bullish harami and bearish harami and lastly tweezer bottom and tweezer top. The main thing we want to look for, which is really the very first thing that we are going to look for when we’re trading is looking to find the Kijun Sen at any support level or resistance level. We want to look for either a (bullish) tweezer bottom or (bearish) tweezer top. The tweezer bottom forms after a downtrend. When the previous candle is bearish then it forms this support level which you can see below. 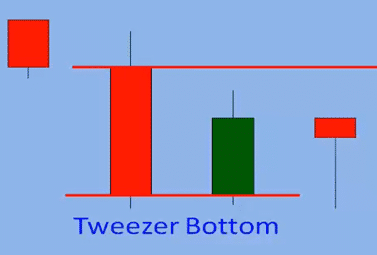 So you need a red and green candle to get a tweezer bottom to form its support level. Then the same thing goes for a bearish tweezer top and the resistance level. If this was your Kijun Sen and the market is moving upwards, the previous candle is bullish and it forms a resistance level. So you have a green candle and a red candle. Before we had a red and green candle. You can never have the tweezer bottom or top unless you have two opposite candles next to each other. You can clearly see the formation of either a support (left) or resistance (right) level. Of course, it looks like minor support but it’s the start of support. 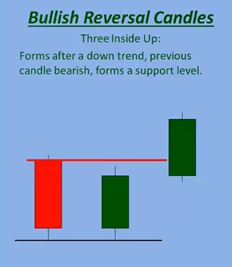 You cannot have support unless you have a red and a green candle next to each other. If we see all red candles, then we are never having that support level. All green would mean we would never having a resistance level. So even if this is just minor support or resistance it is all we need to get into a trade. The market has to stop moving down, or the market has to stop moving up, because most of our trades are going to be based off of reversals. We will be following the trend, but we are going to get a reversal pullback trade. So, we look for a pullback to one of our levels (support or resistance) and then at that level we look for the reversal and get into the trade. This tweezer bottom formed when the market was moving up, then the market moved down and then you have a red and green candle next to each other forming the tweezer bottom at a support level, which is your Kijun Sen, and then the market went higher. We can see that the market was in a small range, but we can also see a trend up there and a big pull down at the Kumo support. At one point a tweezer bottom formed, followed with a red candle that broke through the tweezer bottom. However, this red candle never closed below the tweezer bottom here. And then we had another tweezer bottom. Once we get above the Kijun Sen (blue line), we have a trading opportunity (larger green candle after the second tweezer bottom formation). We need a tweezer bottom to form support or resistance. Let’s have a look at a tweezer top example now. 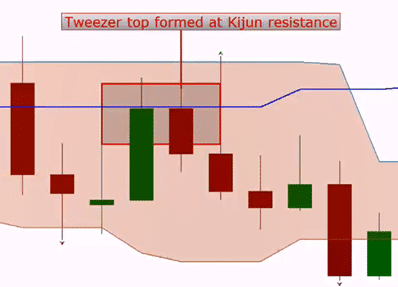 This tweezer top formed at the Kijun Sen resistance. 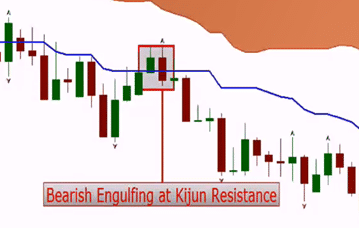 We can see a green and red candle right at the Kijun forming a resistance. If we had another green we would keep going through the Kijun, but we have green followed by red which lets us automatically know: tweezer top. Now we look for a trading opportunity. We need this tweezer top as a signal to just let us know that there’s an opportunity at our level. Right at these levels is where the market talks to us. Inside trading is going to be the main thing that we are going to be looking for and in order to have inside trading you need a tweezer bottom. This means that we trade inside of the previous candle. We’re looking to trade inside with the bodies and we won’t worry too much about the wigs (shadows). The body of the second candle forming the tweezer bottom has to be inside of the previous body. 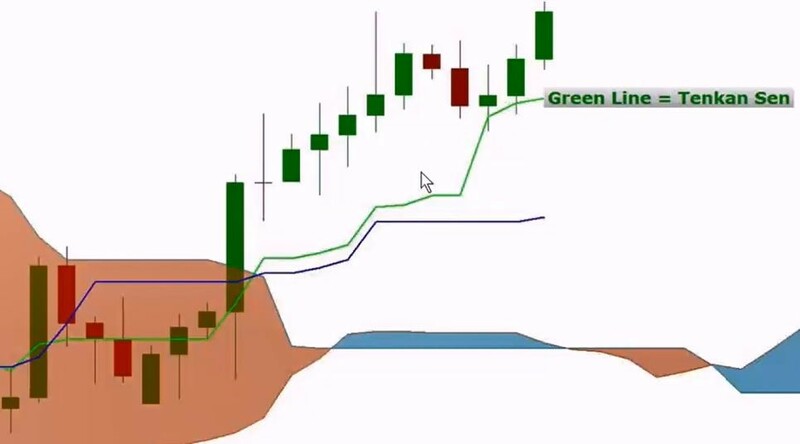 Then we can see inside trading of the green candle, which is trading within the body of the previous candle. 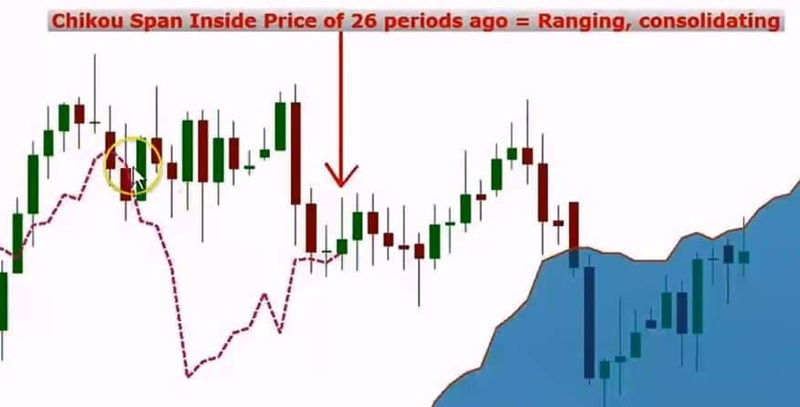 Even if the wig of the green candle would have gone much further up, we would still consider this inside trading because the body of this candle was trading inside the body of the previous red candle. That’s all we need to worry about. The second candle broke outside of the red candle’s body, which means we don’t have inside trading anymore. 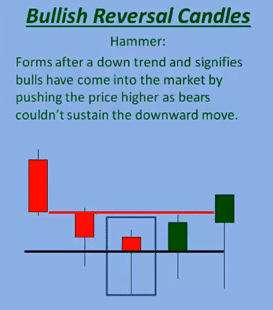 The hammer is a bullish reversal candle that forms a downtrend and signifies the bulls have come into the market by pushing the price higher as the bears couldn’t sustain the downward movement. The above picture shows that at first there’s no bulls in this market (first two red candles) and the bears were able to push the price lower and lower. There’s some bulls in the second red candle from the left but it still shows that there’s not enough bulls buying. Then the market stopped or paused at one point as more and more bulls entered the market, pushing the price back up. The line shows a significant level where buyers are starting to come into the market. And when buyers are starting to come into the market, we want to come into the market. We’re coming in with the bulls and go Long with the bulls. As a side note: we’re not going to look at a hammer or doji as inside trading. The hanging man is the opposite of a hammer. The hammer is at the bottom and the hanging man is forming at the top. It’s the same identical pattern but it’s just forming at the top. This signifies that bears have come into the market, because all along you have bulls in this market pushing the price upwards. We can see all those green candles, signifying that the bulls are in the market and that there’s no or not many bears. The market is going higher and higher but then, all of a sudden, we get a tweezer top. So, the market stops and then the bears push this thing all the way down. Even though the bulls pushed it back up, this signifies that the bears came into the market and started pushing the price lower. This is a level where bears are coming into the market. Maybe it’s not that many bears quite yet and the market might go higher again, but if all bears are starting to come in, they can push this lower. 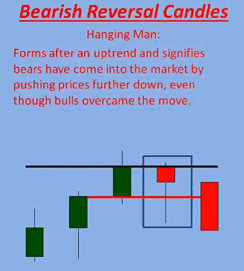 The hanging man candle tells us that bears are starting to come into the market at this price level. Now, let’s take a look at a few more practical examples. 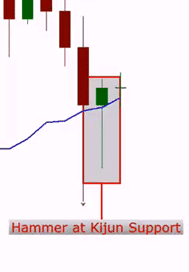 First, we have a hammer at Kumo support level. Once again we would like to highlight, that we need to be at a support level. Having this pattern anywhere else on the chart makes it invalid. We definitely need to be at a support and resistance level and we are going to look at using the Ichimoku system at the top of the Kumo cloud, the bottom of the cloud and mainly the Kijun Sen as well. Of course, we’ll also look at fractal levels too, but we will get into those later. Above we can see the hammer at support, then we see the price stall and we got a tweezer bottom. Now we are getting interested in the market and finally the price takes off. We can see that the bears pushed this all the way down, but the bulls came into the market and pushed this thing all the way back up. At first, the bears were all in this market but then the bulls came in once they got down to a price they wanted to enter and pushed it all the way back up. Now the bears are in this market. Are they telling us they don’t want it to go any lower? This could mean that this Kijun Sen holds and the price goes higher. The hanging man represents the market is coming down. We can see a retrace and then the market goes back down. Just before the hanging man there was a lot of indecision. Then the market pushed way down but then the bulls were able to push it back up. This signifies that bulls were still in the market, but it mostly highlights that bears were coming into the market, because before the price was moving up. Then we had a retrace and that’s where the bears jumped in. The bulls did push it back up, but this is a level where bears are and where they are trying to push the price down. In this example, the bears didn’t allow the price to go any higher and the market dropped further down. 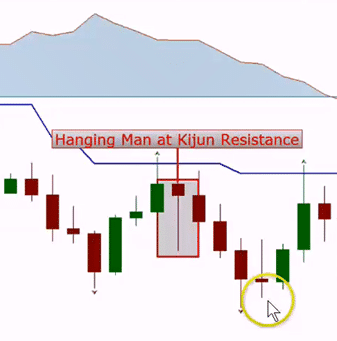 Next is a hanging man at the Kijun Sen resistance. First we’ve got our level before the Kijun Sen, bulls are pushing this up, but the bears come in and don’t let the price go any higher up. Then the bears push it all the way down and finally the market drops. We got the Kijun Sen as our Stop-Loss level. 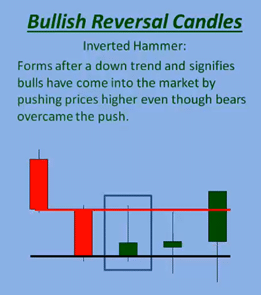 The inverted hammer forms after a downtrend and it signifies that bulls have come into the market by pushing prices higher even though the bears overcame the push. Looking at the picture above, we can see that the market was coming down when bears were pushing it down hard. But, all of sudden, we see a push higher. This lets us know, that at this level bulls are starting to jump into the market. This could signal that the bulls won’t let it go any lower. Now we can use our levels to let us know that it’s at a strong support and resistance level such as the Kijun Sen. After the inverted hammer, we can see that the market moved up. 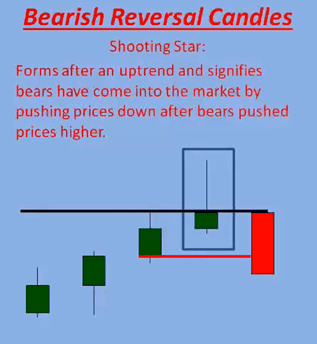 Next we take a look at the opposite candle, the Shooting Star. 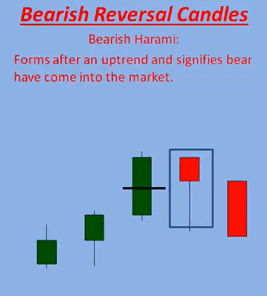 It forms after an uptrend and it signifies that the bears have come into the market by pushing prices down. These are our trading signals that we need to be looking for to get into a trade. Once again, we’ll be looking at some practical examples now. 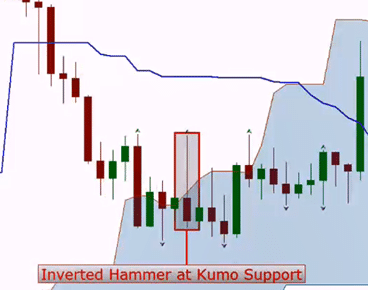 We can see an inverted hammer as the price was moving down and the inverted hammer at the Kumo support level signals that the market didn’t really want to go too much further down. As a result, the price started to move up higher. 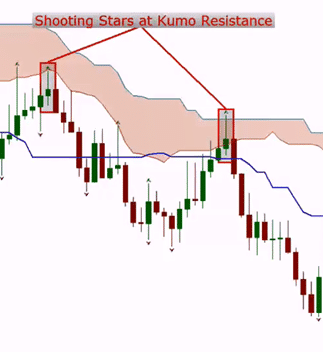 Bulls were pushing the price higher and higher up, then we have the shooting star at Kumo resistance and the market drops. 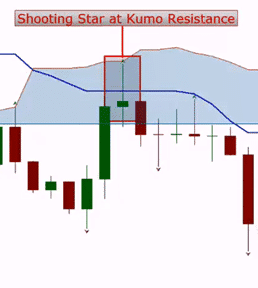 We can see the same pattern: the market was moving up, then the shooting stars occurred at Kumo resistance level and the market dropped. Moving along we are now going to look at Dojis. Dojis often have long wicks / shadows as well. These types of candles represent major indecision in the market. The market is in equilibrium and the price isn’t really moving into any direction. When we see these candles, we don’t want to look into entering the market because we want to see a clear indicator, a clear level. Even though it is not necessary to know all the different types of dojis, it’s good to know what they look like. You really just need to look for long wicks either / or at the top or bottom or even both. The examples above show the long leg doji with a long upper and lower wick. 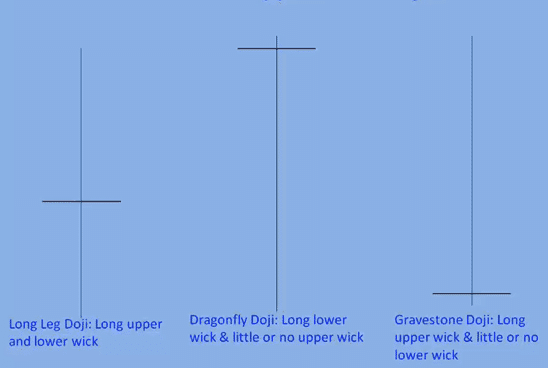 Then we have the dragonfly doji with a long lower only a short or no upper wick. The last one on the right side is a gravestone doji, which has a long upper wick and only a small or no lower wick. Now, let’s check out the northern and southern dojis. 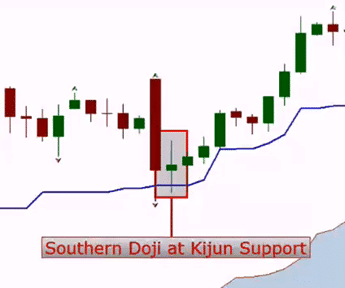 Above we can see a southern doji at Kijun Sen support. It is called a southern doji because it formed when the price was “moving down south”. The market was moving downwards, then we had quite a bit of indecision at Kumo support and finally the market reverses and moves up higher. We can also see inside trading, a lot of it! Simply watch the long red bearish candle and all those candles on the right hand side that trade within the body of that long red candle. 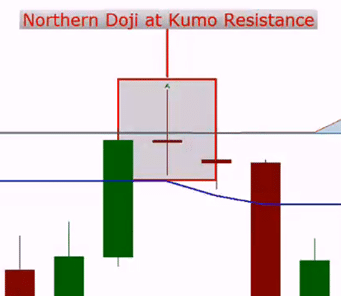 So, above we have a northern doji at Kumo resistance level. The market was moving up higher, then we see a lot of indecision with bears entering the market and finally the market drops. 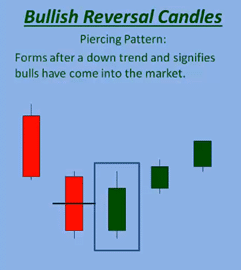 The piercing pattern forms after a down trend and signals that bulls have come into the market. 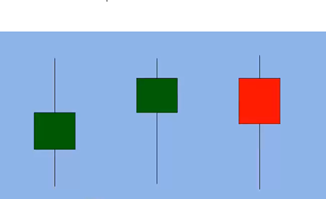 The market was moving down and then this green candle in the middle signifies that bulls are coming into the market after it closes green and higher than the mid-section of the previous candle. This is called a piercing pattern on an uptrend. The first red candle closes lower than mid-section of the previous bullish candle. 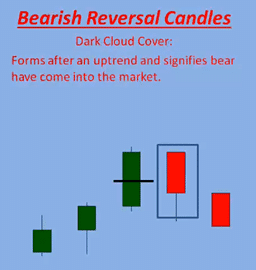 In both cases, the piercing pattern and the dark cloud cover we can see inside trading, because the reversal candles are trading inside the previous candle. The green candle closes higher than the midsection of the previous red candle and then the market moves higher. 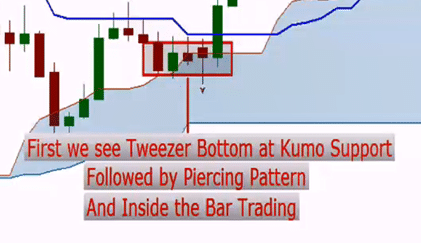 Next, we see a tweezer bottom first with the first two candles – red and green – at the Kumo support level, followed by a piercing pattern (the same two candles). Then it is all inside the body trading, because none of the candles is closing higher than the body of the red candle. Finally a decision is made, the next candle close higher than that first red candle and the market moves higher. In the above section we got a lot of clues for us to get into the market. The red candle close lower than midsection of the previous green candle and the market drops. Also notice how the market moves on the other side of Kijun Sen (blue line)! All signals for us to enter the market. 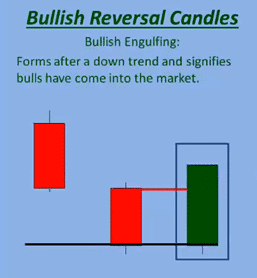 A bullish engulfing forms after a down trend and signals that bulls have come into the market. In the above example we can see that bears were pushing the price lower and lower and all of a sudden, bulls jump in and the market close higher than the previous red candle’s open. 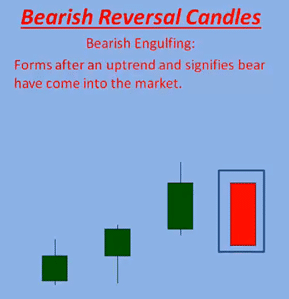 This is a bearish reversal candle at forms after an uptrend. It signals that bears have entered the market and we can see that the bears were able to close this candle lower than the previous candle’s open. This is going to be major for our trading strategy. We want to see either a bullish or bearish engulfing where the candle closes higher or lower than the previous candle’s open price! If we want to go Long, we want to see the bullish engulfing and if we want to go Short, then watch out for a bearish engulfing signal! Again, let’s take a look at some practical examples. 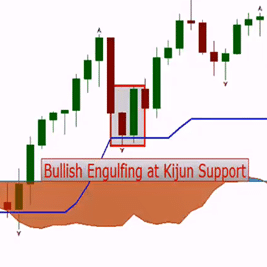 Below we have a bullish engulfing at Kijun Sen support level. Remember all these signals need to happen at a support or resistance level. Either Kijun Sen or Kumo cloud! We can see the bullish engulfing where the bullish candle closes higher than the previous candle’s open price after a down trend. Finally, the market continues to move higher. 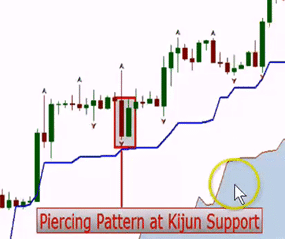 The market is moving up, then have a pull-back pull back to the Kijun Sen support level. Then you have a green candle engulfing this whole previous red candle and closing higher than that red candle’s opening price. This is a nice time to enter a trade! Finally, the market moves higher. Everything happens at support and resistance, mainly again the Kijun Sen! This is what you really need to understand and get into your mind, because this is where we are going to be looking for a lot of trades. 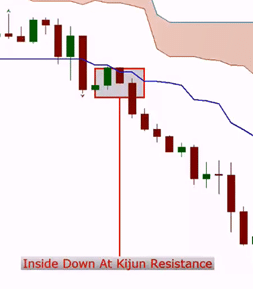 The bears were engulfing right at the Kijun Sen resistance level, the candle closes lower than previous open and the Kijun Sen and then boom.. the market moves lower. Notice how we had a tweezer top and then a bearish engulfing? That’s another good opportunity to enter into a trade. 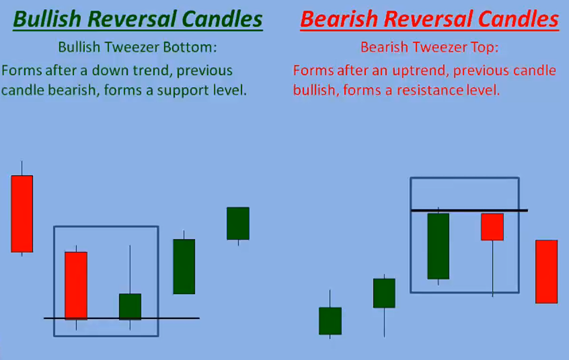 We see another tweezer top followed by a bearish engulfing pattern and the market drops. As soon as we see that bearish engulfing, we’re good to get into a trade with a Stop-Loss at the Kijun Sen. So, it’s a bullish reversal candle that forms after a downtrend and signals that bulls have entered the market. We really want to look for a tweezer top or bottom and inside trading. Period. You really just want to look for the inside trading and that is where we get concerned. And inside trading happens at the levels that we talked about. Mainly the Kijun Sen, the Kumo and the support and resistance levels that we have. Now we are going to talk about our triggers. Before we were discussing signals, signals that we look for before we are going into a trade. Even though you don’t have to remember all these signals, it’s still good to know about them, because you can implement your own strategies and not just the ones that we talked about here. You might end up building many more strategies on top of the ones that we are discussing and that is where knowing all those signals gets really beneficial. What you need to know though is, what these signals are and what they mean or what it signifies. That will help you to learn to trade better. We already talked about how they form after a downtrend and that it signals that bulls have come into the market by pushing the price higher as bears could not sustain the downward move. This is going to be a signal and not a trigger yet. If we have all bearish candles and we are looking for inside and outside trading. We never consider the body of a doji to be inside trading. We can’t say that this next candle closed outside of the previous candle’s body. Even if it was inside it’s too small and the candle’s body has to be bigger! We’re going to go back to the previous candle (second from the left) and include that with the doji. This gives us two candles to look at. Now we would need to close higher than the open of that previous bearish candle and the market goes up and goes higher. So, now we are looking for this red line level. Normally, we would look for this mid-section of the bearish candle, right after we see the tweezer bottom, but we cannot consider this doji candle because its body is too small. We have a tweezer top and we can consider this previous body. 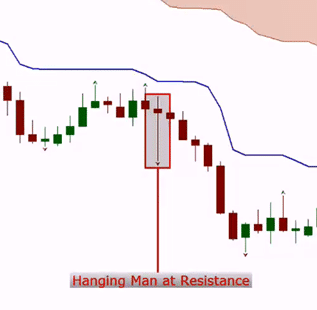 We are looking at the last green candle before the hanging man as our inside and outside mother bar. Finally, the price breaks out (red candle on the far right) and there is our trading opportunity. We can’t use this as a trigger because the price doesn’t close above the open of the previous candle (red line). 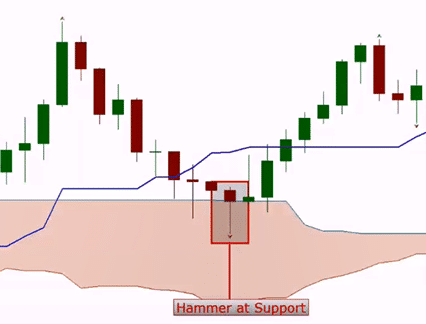 This inverted hammer forms after a downtrend. Prices are pushed down, then the market moves higher but the bears push it back down. We are looking at the red line level once we see this inverted hammer. After we have the tweezer bottom (dark line) form, we are looking to close higher than the red line level before we enter a trade. We see this was a green candle going up, so we have to go down to this second last green candle. 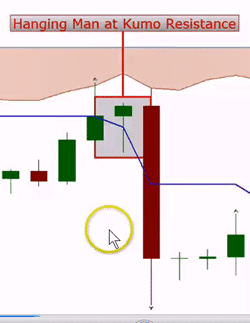 We can’t use the body of the last green candle (doji) because it’s too small. 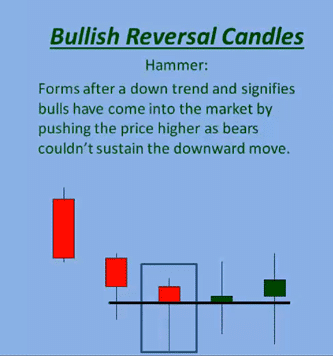 Instead we need to consider the second last green candle. There are times where we can trade this doji as well and we can put your Stop-Loss level right at the top of the wick of this shooting star candle, but we like to consider the previous candle as well. This gives you more momentum. It’s better to enter at the red line level with a Short position, once the candle closes below the opening price of that second last green candle. If you are on brake break the candle here. This is entering after the next candle closes anyway so I’m going to wait and enter here at this level. 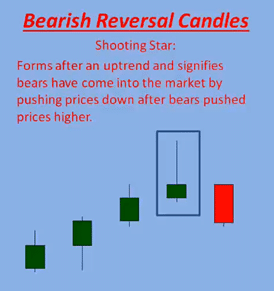 You have to include this as I showed you before with the Bears candle when you had two bears together and two bullets together now forming that shooting star. All right so now we’re going to talk about the triggers and the triggers are going to be like the trigger is where you pull the gun you get into the trade. Finally, we are going to talk about the actual triggers. The trigger is where we “pull the gun” and enter into a trade. Below we have a bullish engulfing. As soon as we see the tweezer bottom and we notice the bullish candle closing higher than the previous bearish candle’s body, we have got our signal. Of course, as highlighted numerous times before, the tweezer bottom needs to happen at a support and resistance level – the Kijun Sen or maybe the Kumo. 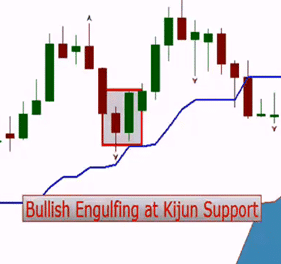 This is our trigger: the bullish engulfing at the Kijun Sen level. Stop-Loss at Kijun Sen level. Done. We see a tweezer top and the reversal candle closes lower than the opening price of the last bullish candle (red line). We have a tweezer top and bearish engulfing because the reversal candle closes below the opening price of the last green candle at the Kumo resistance level. This is our trigger! We enter the trade after the reversal candle and follow this thing all the way down. The last thing we want to go through in this section her is the Three Inside Up and the Three Inside Down. It won’t always be just three candles. Sometimes it could be more but never less. What we are going to consider is the inside trading. We have three candles inside up here but it could be more than those two candles trading inside the body of the last bearish candle. 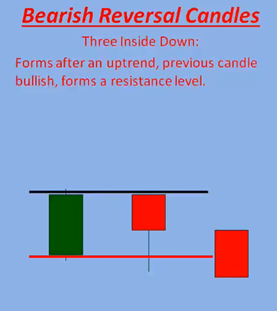 In this example, it is three inside up because the third candle is outside the body of the last bearish candle which is the trigger to enter into a Long trade. 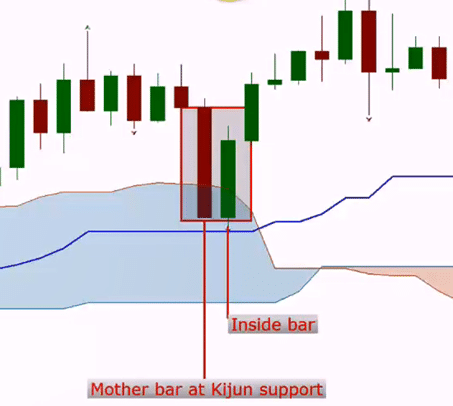 There can be six, seven or eight candles trading inside the mother bar. In the above example, price breaks lower at the third candle. That’s what we want and that’s what we look for before entering into a trade. It has to be at a support and resistance level though! The price pulled back to the Kijun Sen support level, then we have inside trading and we enter the trade once we close outside and run with the trade. Can you see how strong and important this Kijun Sen support and resistance level is? Basically, this is a dark cloud cover but we don’t need to notice that. All we need to see is the inside down trading. 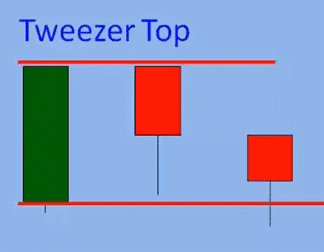 We have the tweezer top, then inside trading and we finally break out of the inside trading. That’s all you need to know for now. 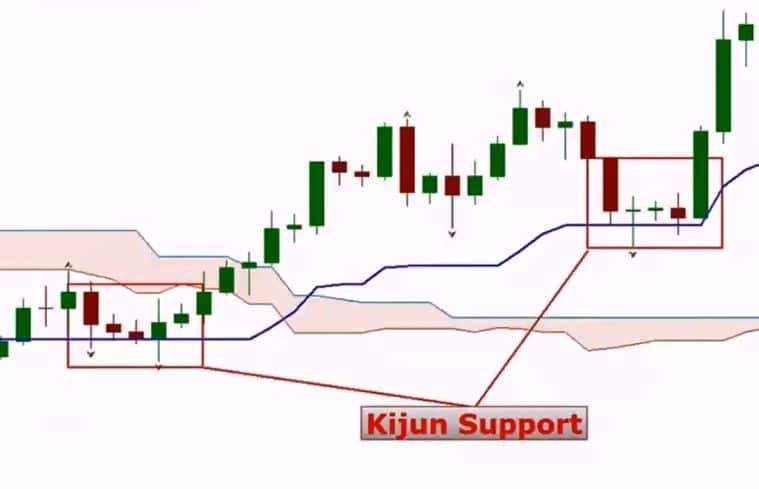 We’re going to apply it in our next lesson using it with trade entries, with support and resistance levels which will be the Kijun Sen and the Kijun Sen bounce. While the market is moving higher or lower and it just keeps moving, there’s no need for you to even look for this kind of stuff, for all these triggers and signals, because it doesn’t matter if it just happens somewhere in the air. It needs to be happening at a support or resistance level and not at a random place. Welcome back everyone! In this session we are going to focus on the part that everyone is probably waiting for: the trading setups. We are going to start off with the TK Crossover trade. We will be starting out with all basic trading styles from the Ichimoku system and then we’ll get into the more advanced trading styles. 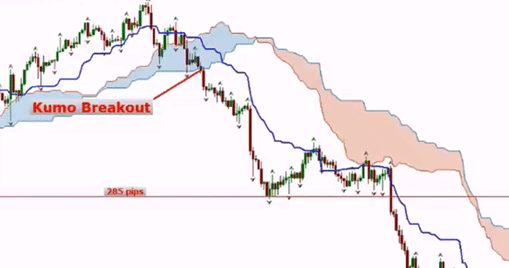 However, keep in mind that you can be very profitable just trading the basics of the Ichimoku trading system. 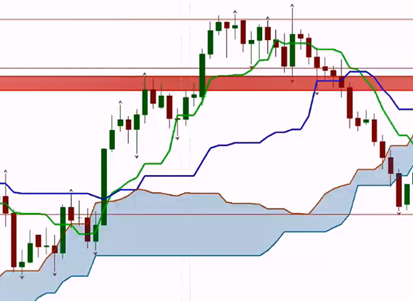 Later on, we will get into more price action trading with the Ichimoku system, but for now we are going to go through all the basic setups that we need to learn and then we will get into some other parts as well. So, let’s start off right now with the TK Crossover trade. This is probably the most popular strategy of the whole Ichimoku system. This is one, Tenkan Sen and Kijun Sen cross each other. This means, that he trade is generated when Tenkan Sen crosses the Kijun Sen from above or below. > If Tenkan Sen crosses Kijun Sen from below, we would describe this as a bullish signal and you should enter a Long trade. > If Tenkan Sen crosses Kijun Sen from above, this is a bear signal and represents a Short trading opportunity. > We don’t want to enter into any TK Corssover trade when Kijun Sen is flat. Now, the last point is going to be twofold, because a lot of times the Kijun Sen is going to be flat when you get into a trade. This is, because when it is flat the market is ranging. But we have to be careful when we see it flat and sometimes it is going to be really hard to tell if we should take a trade or not. A lot of times you may not get a trade with a TK crossover if Kijun Sen is flat, because you’re going to use your Chikou Span to decipher your trades. The Chikou Span is going to be your best friend, because it’s going to tell you “yes you can take the trade” or “no, you can’t take the trade”. Big trades do happen off of a flat Kijun Sen though, because as we already mentioned, the Kijun Sen is flat when the market is in equilibrium. The ideal market is equilibrium because you have equal buyers and sellers which means we’re getting everyone into the market – buyers and sellers. When we have either excess demand or supply we have either more sellers than buyers or more buyers than sellers and that is obviously not an ideal market. We want to get into the market when the market is in an ideal situation and has an opportunity to go further away from Kijun Sen. This means that we want to get into the market near Kijun Sen and then we can get into some big runs. We already went over each component and also the strength of signals but we have to refresh a little, because this stuff is fairly complex and complicated and this will probably hold you back a little bit. As broken down above, if you have a signal above the Kumo, it is a strong signal on a Long trade. If you have a signal inside the Kumo, no matter where you’re trading, it is always a neutral signal. Remember: any signal inside the Kumo is going to be neutral, no matter if it is a bearish or bullish signal! Lastly, if the signal is below the Kumo on a Long trade it is a weak signal. The TK crossover trade is a moving average crossover trade but it’s a little different than your basic moving average crossover trade, because moving averages use the closing price whereas the Tenkan Sen and Kijun Sen use the highest high and low was low for a certain period of time. The nine period and the 26 period. This way we are getting the highest high and the lowest low and that whole range of the market. 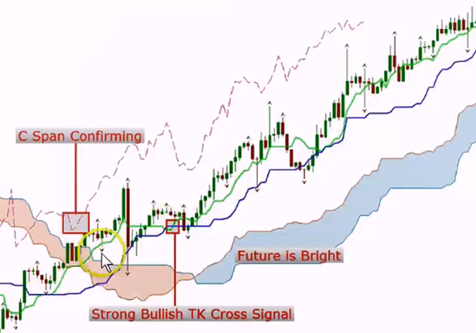 TK crossover signal identifies that momentum is shifting in one direction and that a strong move is likely approaching. A buy signal is generated when the Tenkan Sen crossover above the Kijun Sen and a sell signal is triggered by the Tenkan Sen crossing below the Kijun Sen.
As with any trend following system, the signals work well when the asset develops a strong trend, but it’s ineffective when the asset is in a range. It can be used on any time frame, but it’s better suited to be used with a higher timeframe such as the “4 hour” and “daily”. The best signals occur when both lines are moving in the direction of our trade. For example, if we are going Long we want to see both of those lines going upwards as well. Keep in mind that Kijun Sen typically moves a little slower which means that sometimes we will see Tenkan Sen drop below while Kijun Sen is still pointing up, but then Tenkan Sen will come up above it. That would be a very strong trade, because we would have them both pointing in the same direction upwards where we are going. Here are a few rules for us to check before we enter into a Long trade. 6. Exit if we see a bearish TK Crossover; price close below Kijun Sen or price close below fractal. 6. Exit if bullish TK Crossover, price close above Kijun Sen or price close above fractal. In the above picture, we can see a TK crossover right in front of our eyes. We would enter into a Short trade right on the close of the red candle. Now, remember, a lot of times when these TK crossovers happen, we wouldn’t want to get into a trade because the crossovers happen far away from the Kijun Sen and we shouldn’t be entering any trades that are really far away from the Kijun Sen. In the above example, it doesn’t look like the crossover is that far away from the Kijun Sen. This is a strong bearish crossover and the future has been bearish for a long time in this scenario. We don’t see any other crossover which definitely means it’s a bearish trend. We can also see that at the close of the candle 26 periods back, the Chikou Span was below price. This further confirms that we can enter into the market. It’s a fairly weak Short signal, because the crossover happened above the Kumo. Although it is a weak crossover we entered the market and it worked out pretty decent in the end. 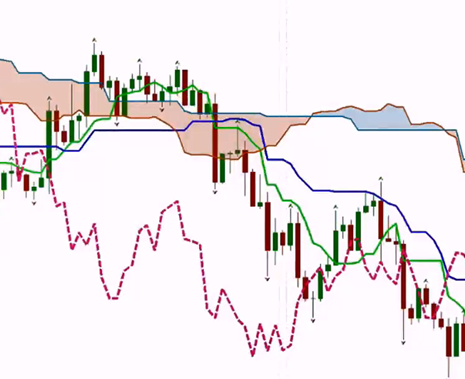 26 periods ahead we had a bearish future and we also had the Chikou Span below price and below the Kumo cloud. This shows you once again that the Ichimoku system is for a trending market. Once the market is not trending you are going to have all these whipsaws especially with the TK crossover signal. You can even see that other signals wouldn’t have done us any good here because the market would have whipped us all over the place. This highlights once again, and we do have to bring it up so you really remember this: always look at your main man: the Chikou Span. He’s going to tell you if you could get into the trade or not. Let Chikou Span decipher your trades and we will look for that more when we get to the live charts later on. First, notice that the Chikou Span is not confirming the move as it is sitting inside past price levels and price ranges for a while until she comes back and firms that move. The signal comes and it is neutral as it happens inside the Kumo cloud and then you also have your Chikou Span inside a price. It was sitting inside of this highlighted price range and it didn’t confirm until it got out of the range (after the box highlighted as “Chikou Inside Pice”). Then when it got out there is where the market goes and takes flight. All of this tells us that we have to wait until we get the Chikou Span outside of that price range. This is also one of the reasons why we don’t want to take these trades, because as you can see here, when the crossover happened the price was all up there and finally the price came back down. It needed to get back to market equilibrium and it did. This is why learning about market equilibrium will help you, especially when making certain types of trades. You want the market to be closer and more in equilibrium than farther away. The farther away it is the higher the chance of your trades retracing back to get to equilibrium is, because this is what the market wants to do. The market wants to be in equilibrium where we have equal buyers and sellers. That’s the ideal market. The ideal market is not a market that’s in disequilibrium where there are more sellers or more buyers. So, the basic understanding here is that the market is always going to try to get back to equilibrium. This is what we as traders need to understand. If we are taking a trade while the market is out of equilibrium, we have to know that it’s going to eventually come back to equilibrium and we might be stuck with that trade. That’s why we don’t want to take that trade in the above example and it is too far away from Kijun Sen anyway. We can take this trade right off the TK Crossover not only because it is very close to the Kijun Sen but also the Chikou Span is confirming our Long move (Chikou Span above price 26 periods before). With a Stop-Loss between 15 and 30 pips (fractal level where we point the arrow) we’re save to go into the trade with not too much to worry about. We can then move the SL up with the Kijun Sen as we see fit to take profit at certain points. Next, we are going to look at some other Live Charts to see how it looks like in a real live scenario. Here we can see two TK crossovers in this one chart. The first on the left is a bullish TK crossover with Tenkan Sen moving up from below and price was very close to the Kumo cloud. You can see that the price was moving far away from Kijun Sen which indicates that a pullback is very likely to happen, because the market always wants to come back into equilibrium. The second TK crossover on the right-hand side happened far away from the Kumo cloud and Kijun Sen is also pretty far off of the price. We wouldn’t want to enter in to a Short trade here because it’s not the best signals we’re getting. 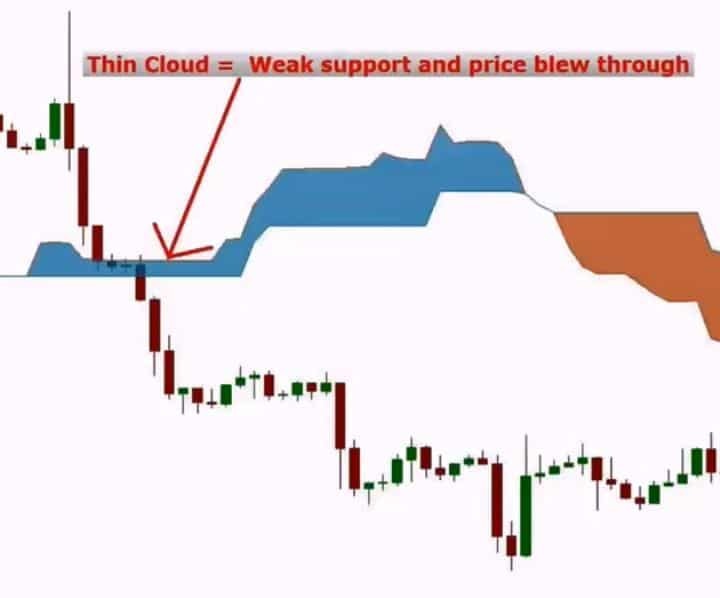 Also, remember, the rules are that when price is above the Kumo cloud it typically means the market is bullish and if price is below the cloud it means that the market is in a bearish sentiment. This TK crossover might just indicate a slight pullback (the market was moving up before so it is not unlikely that it would continue this trend after a slight pullback) before the market moves up again, so we want to stay out of trouble and not take those kind of trades where we’re getting these types of signals. Here we can see a bullish crossover (in the middle), but we cannot take that. On the right there is also a bearish crossover, but we can’t take this either, because the Chikou Span is not confirming. First of all, we’ve got a medium strength signal because the TK crossover is happening inside the cloud. Then we’ve also got our Chikou Span above price 26 periods before and lastly there is also a double bottom here. When we can see a double bottom or a double top we can further go to the ultimate oscillator and see if there’s divergence. We will get more into divergence a bit later in our course but for now keep in mind that divergence can help us identifying if we can get into a trade or not. Alright, last example for our TK crossover trade part. This is a trade on the CHFUSD FX pair. First we had a bearish crossover and then a had a bullish crossover. The bullish crossover comes again with a medium strength signal because it happens inside the Kumo cloud. We could have already gotten into the trade before the TK crossover because there’s a Kumo breakout, something we will be looking into very soon! Now, if we had taken the trade and went Long, we would have made some good profit. However, the thing about this bullish TK crossover is again, that we were getting really far away from Kijun Sen, which signals that the market will very likely want to return to equilibrium again very soon. All of what we were talking about here should help you guys to learn and be able to use the TK crossover trade. 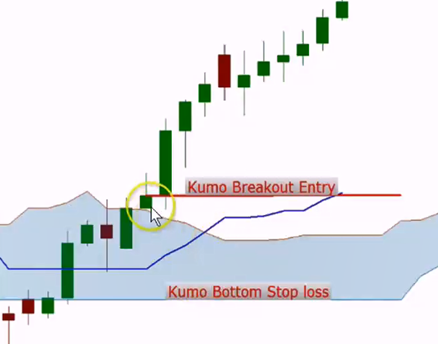 In the next lesson we will be taking on the next strategy, the Kumo Breakout. 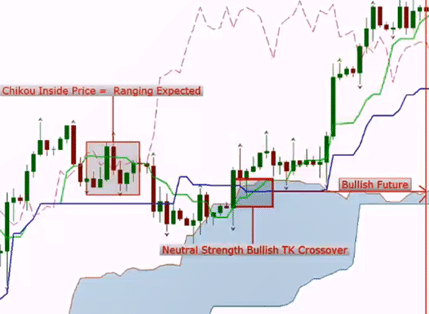 Welcome back to Chapter 4 of our Ichimoku Trading System lectures. 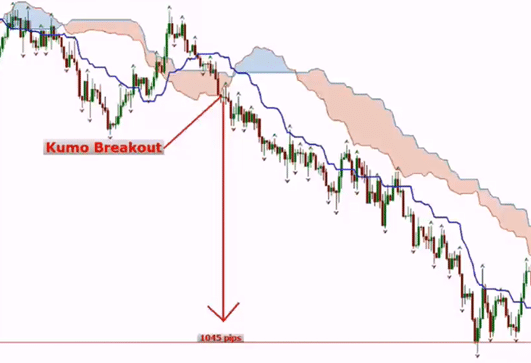 We are going to continue this course and we will do so by focusing on the Kumo Breakout Trade. 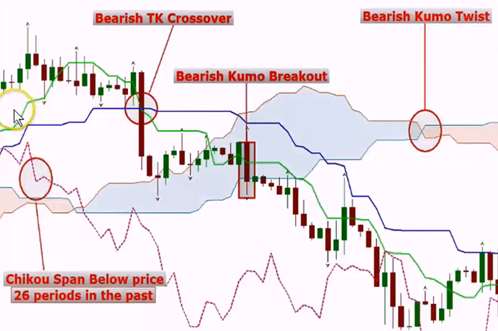 Before, we were looking deeply into the first trading strategy of the Ichimoku system which was the TK Crossover Trade and now we are going to continue on with the Kumo breakout trade. 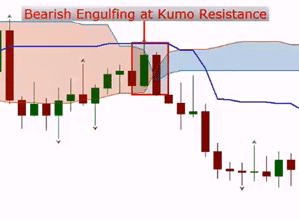 The Kumo breakout trade is a very strong trade. It’s one of the most widely used in Forex or CFD trading. 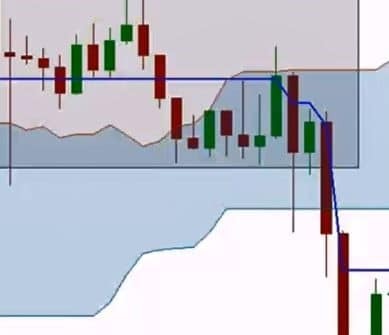 As with any other trading strategy, no matter if it’s within the Ichimoku or any other trading style system, there are a lot of things that you need to know and even more aspects that you need to consider before starting off and jumping into those trades. You cannot become a consistently profitable trader if you do not understand and learn core principles of this or any other system. 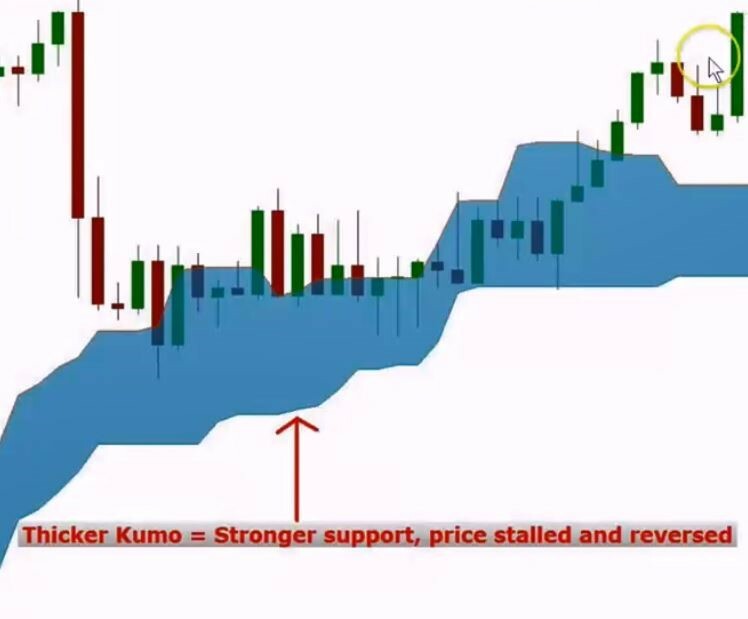 Ok, so this Kumo breakout trade is probably one of the most profitable trades that you will do with the Ichimoku system and it’s by far the most traded. So, let’s start off with this thing. As soon as we come out of the Kumo cloud and have a candle close outside of it, we call it a Kumo Breakout. We need to wait for the candle to close outside of the cloud. If it comes back into the cloud and close there, we wouldn’t enter into a trade! The above example shows a bearish breakout with a total price drops of 285 pips before you even have to think of closing your trade and take profit. New traders would probably get out somewhere earlier because it appeared like there was indecision in the market at one point. The market has structure and it follows that structure. The market pulls back and this is what new or uneducated traders do not realize. We could have made almost 285 pips with this trade, because we’re going to have to get out at the break of a fractal level or the Kijun Sen. We’ll talk about the fractal levels in a little bit but the whole move here was actually 675 pips! An upside move of 265 pips before you even had to think about getting out of this trade. There was no reason to ever exit this trade at all. One aspect you need to keep in mind in all of this is that the fractals will tell you everything. The fractals tell you the structure of the market as you can see in the above example (fractal levels are shown as the arrows on the candles). The bearish fractals are on the bottom of the price and the bullish fractal levels are on the top of the price candle. With the above example, can you see that we’ve ever broken a bear fractal in the uptrend? The answer is “no, we haven’t”, but when we broke a bear fractal here, the market stopped (2 long candles further on the top right) and then the market fell down and started breaking bear fractals! So, when we are in uptrend we don’t see price breaking bear fractals that often and in a down-trend we don’t see price breaking bull fractals that commonly. We are not saying that it can’t happen and won’t ever happen, but the probabilities are in your favor if you use these fractals. This is all we are doing here anyway: we want to put the probabilities into our favor whenever we are going into the market. It’s similar like going into a battle. When you are going into a battle against a group of people that have an arsenal of guns and ammunition. You wouldn’t go into that battle just carrying a knife, would you? You need to be prepared, focused and protected in all ways possible. Defend yourself against the market, its moves and volatilities. If the market wants to swallow your money and wipe you out, well, protect and defend yourself! Make sure you have the probabilities in your favor. Ok, once again, breaking these fractal levels is very important and it tells us a lot about the market structure. If you don’t know what the market is doing, then how can you trade? If you don’t know a range, how can you trade? If you don’t know a trend, how can you trade? The price breaks below the cloud and we can easily end up with a total of 756 pips if you just follow the rules that we are going through here. Again, new or inexperienced traders would have been out much earlier, but we continue to stay in the market and we get out at the break of a bullish fractal or the Kijun Sen. With that you have a chance to make all that profit of 756 pips. This one is a 1045 pips move and we have a good chance to make a lot of profit of that if we follow the rules. You can see that the price closed on the other side of the Kijun Sen and that’s when we would get out of the Short trade. Later, there’s a chance to get back in the market, but you can the market does the same thing here as we discussed in a previous example. It is breaking bear fractals and it’s not breaking bull fractals. Then it’s breaking bull fractals but no bear fractals and until it breaks a bear fractal we can use bear fractals as our Stop-Loss and then we can know where the market is going. 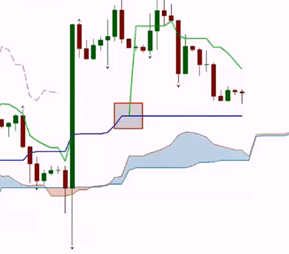 We will have a section specifically on fractals and how to incorporate them into the Ichimoku System of trading. This is a bull breakout to the upside and we want you to really see the opportunities and how breakouts give you access to great gains if you follow the rules. 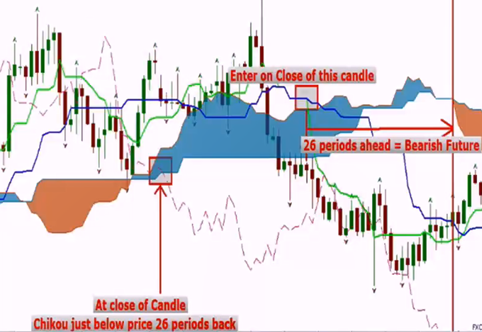 We would get into the market where the candle closes above the Kumo cloud (where we put the “Enter” sign). Novice traders would get out way too early because they don’t understand the market movements and that there are pull backs. They are scared and they don’t understand the structure of the market. We do know all of that and we know this is the equilibrium spot. Ok, so we know the market has the potential to pull back to the Kijun Sen, which is past this “Novice Exit” level. It means that we are prepared for it and that we know our risk. In this example, the market continues going higher. The inexperienced Forex trader would have made about 20 pips at best here. But look at us: we have a chance for almost 1.000 pips! Finally, the structure breaks, price breaks through the Kijun Sen and we get out. We enter the market on a bearish breakout and we get out of the market on a fractal exit or the Kijun Sen. We can either capture 770 pips or 730 pips on the Kijun Sen exit. The novice makes approximately 58 pips and then they will probably lose even more than that on the next trade. We gained 700 pips which is much harder to lose, even on 2, 3, 4 trades. It’s pretty easy to lose 58 pips on one trade. 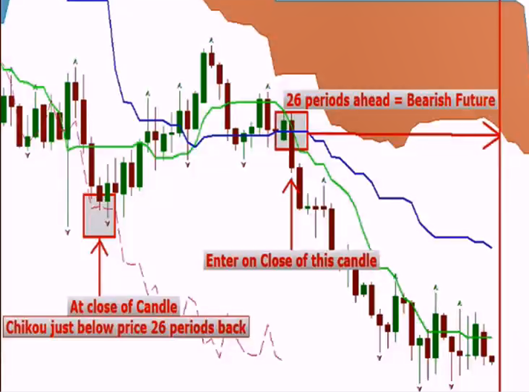 This is what we’re looking for and what the Ichimoku system can do for your trading results. > Exit at price close below Kijun Sen or price close below a bear fractal. Our target is the Kijun Sen and all we need to know is our risk. We don’t even need to know our reward. No one can know the reward anyways. When traders say they have a R:R of 3:1 or whatever that’s what they hope it is. But that is usually not what it is in reality. We, on the other hand, know our risk and that’s it. We don’t know our reward but what we know is our risk. We can deal with that and that is all we want to know. We want to know how much we might lose on this trade. No one never knows how much they’re going to make on a trade. > Exit at price close above Kijun Sen or price close below a bullish fractal. Let’s move on and discuss a few examples. Here, we have another bearish TK crossover and a bearish Kumo breakout. You need to have a bearish TK crossover but it doesn’t matter how strong the signal of the TK crossover is. 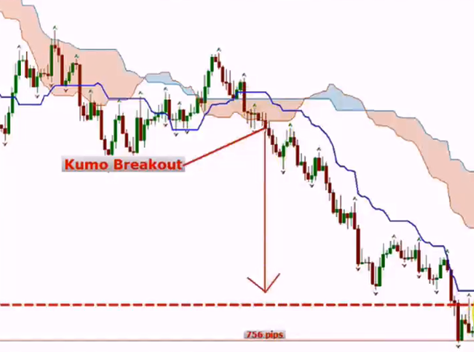 For our Kumo breakout trade we only need to know that there was a bearish TK crossover. We also see Chikou Span below price 26 periods before as well as a Dark Future with the bearish Kumo twist. Here we can take the Short trade on the bearish Kumo breakout because probability is in our favour. 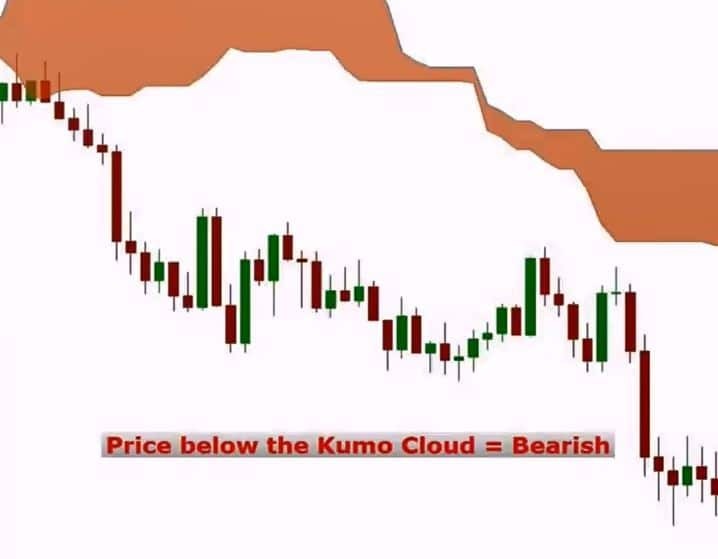 We have a bullish Kumo breakout where Chikou Span was above price 26 periods ahead of the signal and we have a Kumo twist with a bright future. 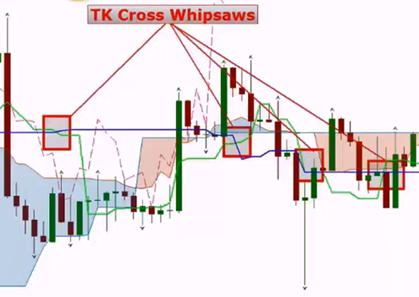 The TK crossover was once again a pretty weak signal, but we had a bullish TK crossover. There is no reason for us to ever get out of the market, but a lot of people would have gotten out early because they would get scared just before the bullish Kumo twist. We, on the other hand, stay in the market until the market tells us to get out of it. We are getting out where we break this fractal level or where the price closes below Kijun Sen. We had never broken a bear fractal in the bull market. You could see that until where we get out. There, the structure of the market changed. > Kijun Sen: it’s always our main Stop-Loss level and every trade we use in every trade we make. Kijun is the equilibrium point of the market and that is where price is attracted back to. 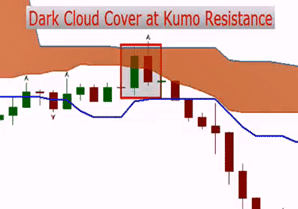 > Kumo Cloud: it forms strong support and resistance levels based on the market volatility. > Fractals: in a Long trade we use bear fractals as stops and in a Short trade we use bull fractals as stops. When the market is trending up, we rarely see bear fractals broker and when the market is trending down, we almost never see bull fractals broken. > Support & Resistance Levels: horizontal, trend lines or psychological levels. Stop-Loss right at the Kumo bottom. We could also put a Stop-Loss at the Kumo top but that wouldn’t allow the market to move much and our Long trade might be closed out very early without much chance to gain momentum. 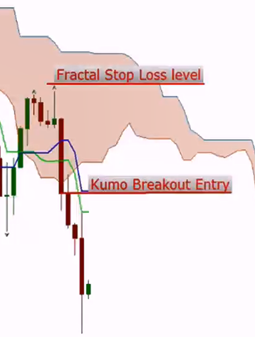 Here we use a fractal Stop-Loss level, because sometimes we might not be able to use the Kijun Sen or Kumo bottom as our Stop-Loss levels because they might be too close to the price. The Ichimoku system gives us choices which is always beneficial. We have a very strong bullish Kumo breakout here and we can put our Stop-Loss at the Kijun Sen level or the bottom/top of the Kumo cloud. Again, you can see that we have choices. What else can we say about this picture here? We have a bullish TK crossover at the exact same time when the bullish breakout occurred, a bright future and the Chikou Span was above price 26 periods before. This would have been a nice, profitable trade and there was no need to ever get out of our position before long. Not all trades are going to work like this no matter which markets we are looking at, so no matter if it’s in Forex trading, stocks, equities, bonds, metals, commodities, digital currencies or whatever. All we can do is put the probabilities into our favour and by taking all of our signals into account and making sure we have all of those signals lined up, we can take the trade or decide against entering into a position. Bottom line is that even by applying all the rules and putting probabilities together we may not profitable all the time. But that’s ok. As long as you keep putting the probabilities into your favour, your chances of becoming a profitable trader increase quite significantly. 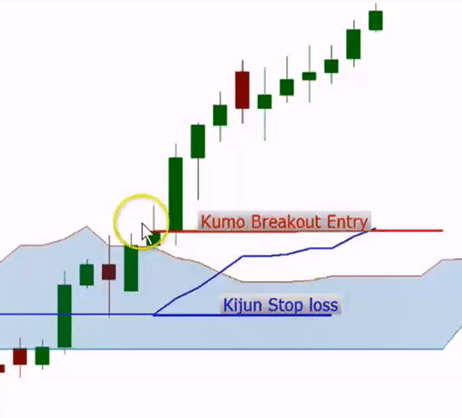 This was the Kumo breakout trade section of the Ichimoku trading system. Make sure to learn about all the rules and make educated decisions.